View More In Fish Poachers. 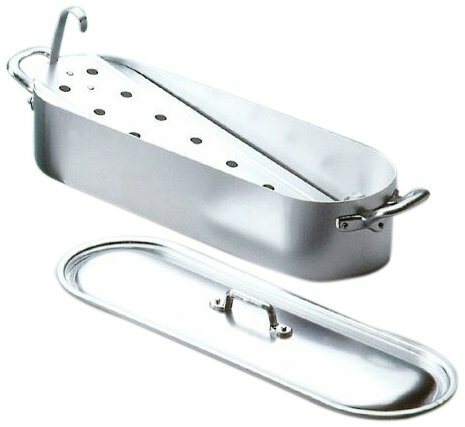 Fish poacher with lid and grid. In aluminum 99,5%. Excellent for all of your poaching needs, provides for the whole fish, fish steaks or fillets. A perforated grid allows for even delicate fish. Poaching allows you to still retain flavor and cook the healthy way without drying fish out. Very easy to clean. Hand-wash only. Measures : length 17.73" x 4.53" depth. Made in Italy. Imported by Tomson Hospitality. If you have any questions about this product by Ottinetti, contact us by completing and submitting the form below. If you are looking for a specif part number, please include it with your message.